I had a great day yesterday on the launch gathering more hydrographic survey data. We had a pretty, sunny day with calmer waves until the afternoon. Then the wind and waves picked up and we were tossed around a bit. It didn’t help that we had to survey an area called Whirlpool Point that is nicknamed “the washing machine”! Here is an 18 second clip as we entered the washing machine until I had to turn off the camera so I could hold on with both hands. Note that at the beginning, she says she’s stopping logging the data and you’ll see why! In this top picture you can see me getting ready to lower the CTD (Conductivity, Temperature, and Depth) into the water. After about 5-7 minutes the CTD is raised and then connected to the launch’s onboard computer which uses special software to download the data from the cast. In the picture below you can see Pat Berube showing me how to connect it to the computer. Once we gather this along with the multi-beam sonar data, the day’s work is saved to a hard drive and turned in to the evening processing crew. They take the raw data from the launches hard drive, copy it to the ship’s network, and convert it to a format that is readable by the mapping software. They apply correctors like sound velocity from the CTD, tide, and the vessel’s motion data to correct the multi-beam soundings in processing. 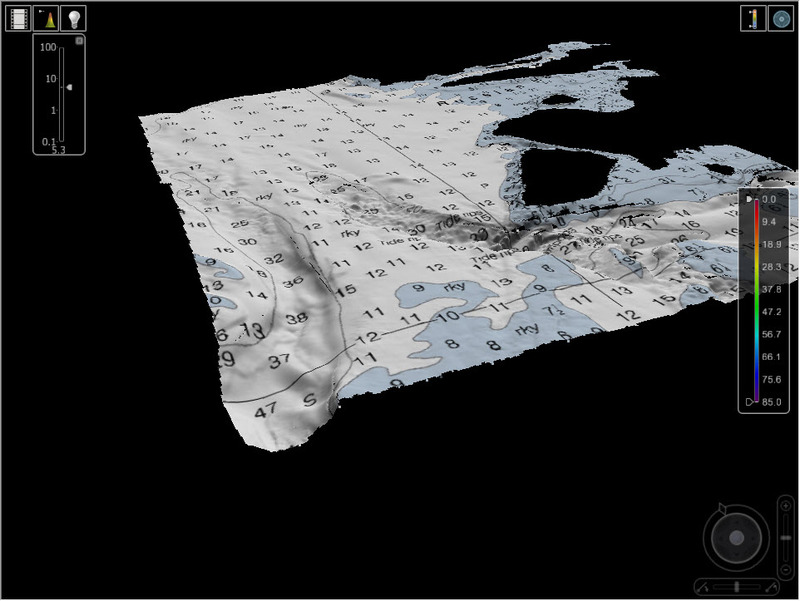 Let me show you what some of their digital terrain models (DTM) look like. When you have a DTM of the seafloor, it shows the morphology of the seafloor in a range of colors and shows features like rocky areas, sand waves, and seismic faulting. These are statistical representations of all the multi-beam sonar soundings. 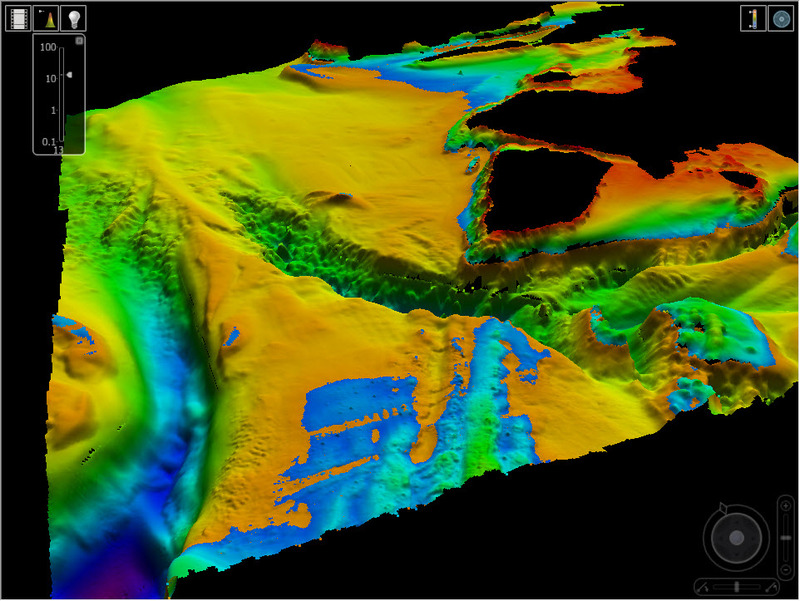 Below you will see two examples of the the seafloor generated by Pat Berube, a NOAA hydrographer, that show a 3D base surface. The first one just has the 3D multi-beam base surface. The second one is the same but it also has a chart draped over it. The chart ends up being the final product with the new soundings shown on it. Look at the bottom left model and you will see a reef in the bottom right, a green trench with rocks in it in the middle and at the top yellow area are sand ripples. 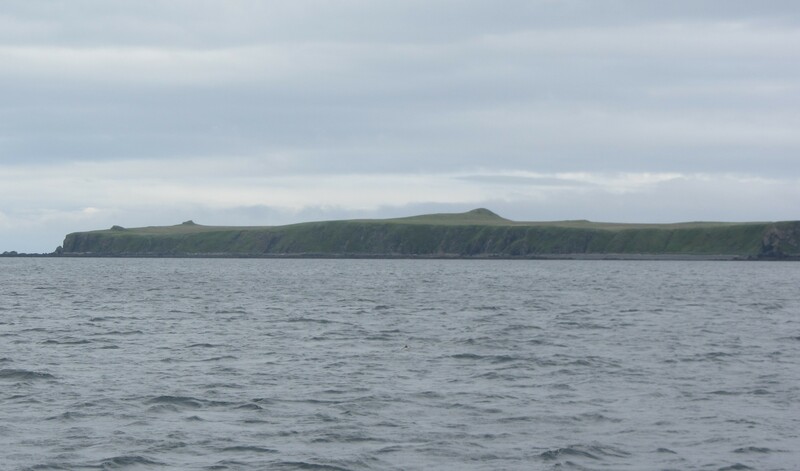 The large round black spot in the middle is an island and the smaller black circle to the right of it is a small group of rocks. There is also another trench on the left in blue. The colors are added to see the features better. The numbers on the chart on the right are fathoms, which show the depth. Click on each to bring up a larger high resolution picture. In the two pictures below it shows the actual land features of the island that is the black circle in the 3D map above and the rock outcropping that is represented by the small black circle to the right. These pictures show how what we see when surveying transfers to what we see on the charts. Rock outcropping NW of Aiaktalik Island, Alaska. 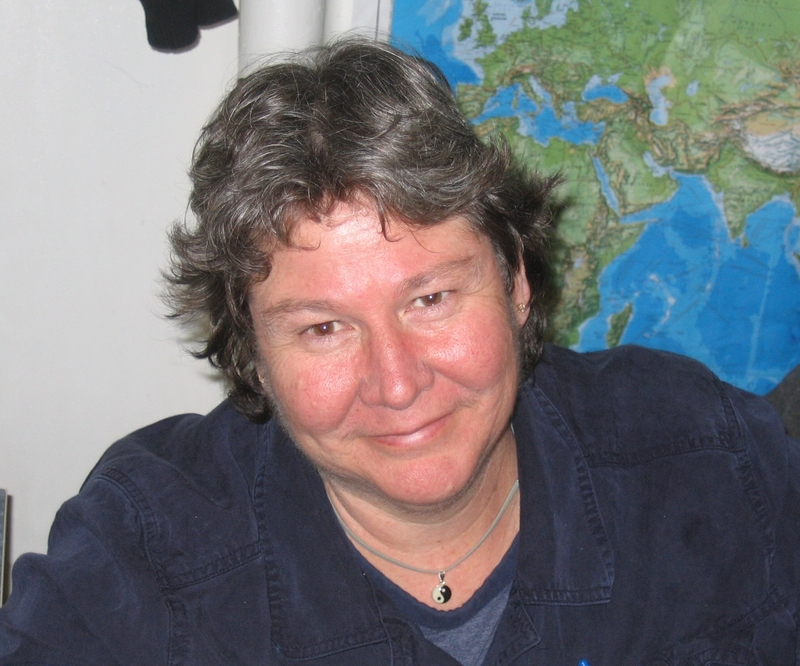 Today I would like you to meet Cathleen Barry, a Cartographer for NOAA who is currently aboard the Fairweather. Cathleen is someone who makes maps, more specifically, navigational charts. And she fell into this field of work in the most unusual way. She was a recent graduate of California State University, Northridge, with a BS in Earth Science. She has loved maps since she was a child, but little did she know then that she would end up drawing maps for a living! 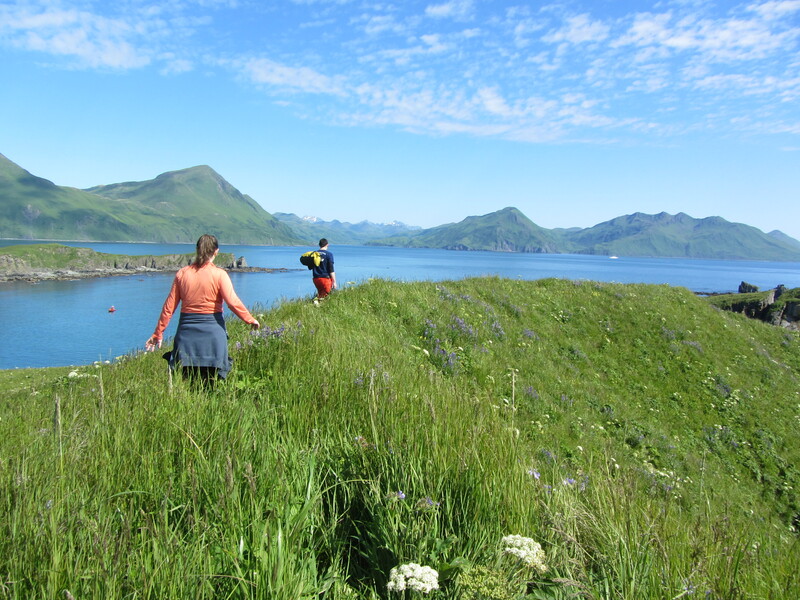 Working as a beginning Cartographer in the Marine Geophysics department on campus, her professor tasked her with making a poster to advertise a NOAA expedition to the Arctic. 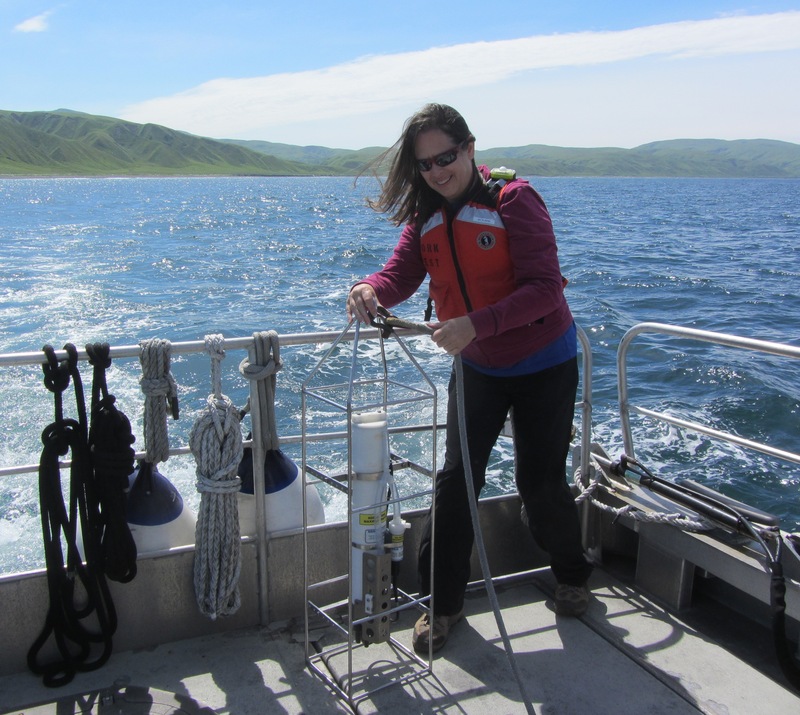 The Marine Geophysics department was looking for graduate students to participate in a geophysical cruise to the Bering Sea aboard the NOAA Ship Discoverer, a 100 meter oceanographic research vessel. When the poster was complete she drew ten lines on it for sign-ups, and after thinking about it, she decided to put her name on the first line. They needed a cartographer to map during this trip and a career was born! This career has sure evolved over the years. When Cathleen started out, cartographers drew with pen and ink on drafting paper and now it’s all computer generated. 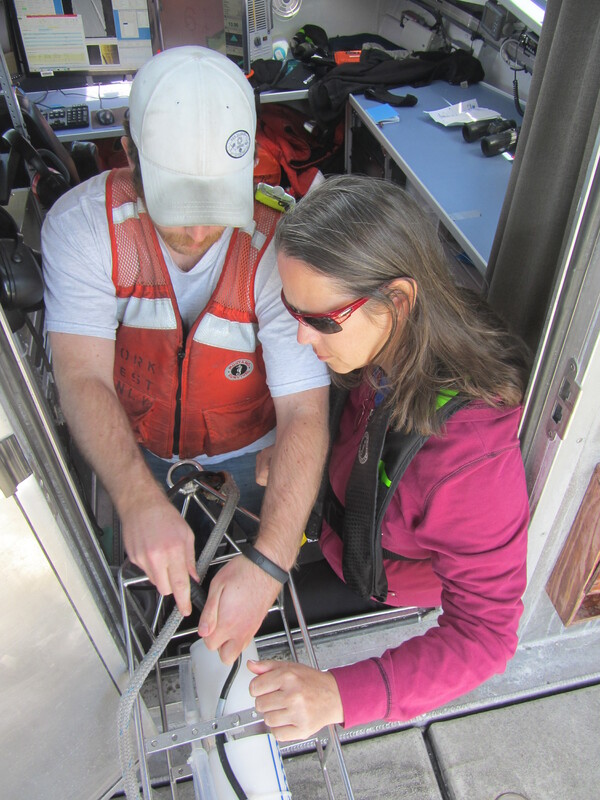 Her job is to use the bathymetric and features data collected to update America’s nautical charts. Earth’s crust is very dynamic and the seafloor changes all the time! When she retires, maybe around 2020, she will say goodbye to a field she has loved for over 30 years. I have to tell you, typing a blog while my body gently sways from one side to the other is very strange. My abdominal muscles, gluteus maximus, and quadriceps are getting a workout as my muscles tighten to help me to to stay put! I do need the mini workout since the cooks here keep us well fed! The weather here is so variable. The temperature on my last blog was 21° C and today it was 10° C with cold winds. I was glad I was not out on the launches today and was interested in working with the mapping on the ship until I heard and saw video of what was in the water today. 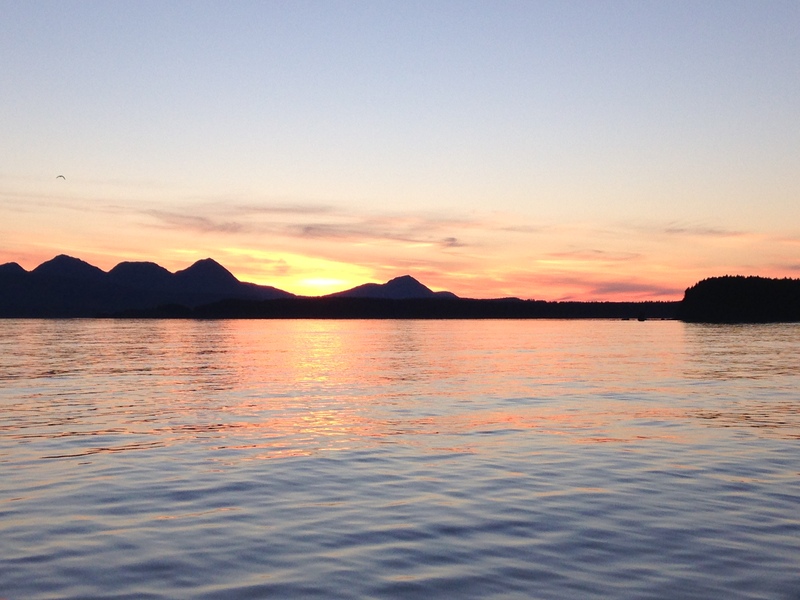 The launches saw a large pod of about 40 orca whales playing about right by their boats! I was so bummed I missed it. Maybe tomorrow?! Then again, tomorrow I will be in a launch that is going to survey a section of the seafloor that has a possible shipwreck in it. Sunken treasure anyone? Question: Which picture do you like better, the daytime picture of Joe and me on the crest of Cape Kaguyak (note the orange Ambar boat to the left and the white ship Fairweather anchored to the right) or the nighttime picture of the sunset from the flybridge of the Fairweather? You can click on pictures in my blogs to see them full size. Vote in the poll below! This entry was posted in 2014, Dana Clark, NOAA Ocean Service, NOAA Teacher at Sea and tagged 3D base surface, Alaska, cartographer, cartography, CTD, Dana Clark, Hydrographic survey, orca whale. Bookmark the permalink.